This game takes place a few weeks after the first game. A new Commander Gear was discovered by the name Dizzy. Worried that a second War would start, another Holy Knights Tournament was started. The person who could capture and kill this Gear would be rewarded 500,000 World Dollars. 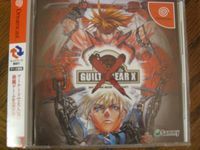 The original Dreamcast version was first released as a limited edition with a special mini-cd. This mini-cd came in three variants, each of which contained two different artworks that can be viewed on a PC, and one specially-selected music track from the game. All three versions of the mini-cd are marked as "Type-A", "Type-B", and "Type-C", and have different artwork on the face of the disc. Additionally, the image found on the GD-ROM differs from the image found on the regular edition's GD-ROM." Source: Wikipedia, "Guilty_Gear_X," available under the CC-BY-SA License.